One of the key factors to achieve a good level of health and fitness is proper nutrition. However, it would be easy for most people to think that super athlete’s diet and fitness regimen is difficult to follow. Fortunately, it’s the case of Virat Kohli’s diet and fitness regimen. Virat Kohli is a cricketer and captain’s of India’s national cricket team. A lot of people are following Hollywood celebrities health and fitness regimens. Unfortunately, many of these diets are just fads and unsustainable. In some cases, it can result in health risks. 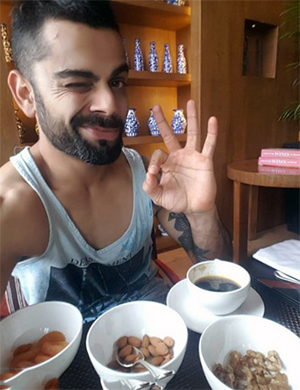 Virat Kohli’s diet and fitness regimen are simple. Anyone can follow his lifestyle especially when it comes to diet. Of course, his taste of foods may not be similar to yours but substitutes are available. The key to his diet and fitness regimen is simplicity. He loves home cooked foods and doesn’t like starving himself. So, it’s easy and since it does not involve limiting food intake and starvation, it’s surely sustainable. Here’s a quick glance on what he does to his food habit and fitness. Virat Kohli loves home cooked foods and not someone who eats often in restaurants. Of course, he has the option to eat anywhere he wants but he prefers to eat home cooked foods. His favorite is maa ke haath ka khana, and for Indians, nothing tastes better than that especially when it is prepared by his mother. On the other hand, during his travels where home cooked foods are not available, he prefers to eat lamb chops and salmon. Both are rich in proteins and healthy fats. When it comes to snacks, it’s difficult for most people to follow healthy options. A lot of snacks available around are unhealthy and full of added sugars. In addition, most people easily reach sodas and coffee. Well, Virat Kohli is different. Even with his snacks, his choices are still healthy. See the nuts? Almonds and walnuts are among the healthiest nuts on the planet. An athlete’s life is not complete without a workout routine. His workout routines include weight lifting or strength training. This helps him develop upper strength. He believes as a cricketer strong abs and muscles, as well as lean physiques, are important. Here’s a glimpse of his workout regimen. When it comes to hydration, water is important. Due to his infection experience during a tour, he now prefers drinking bottled mineral water to avoid those water-borne diseases. He thinks it’s safer to drink such water. After all, hydration is important. Therefore, drinking safe and clean water is highly prioritized. That’s it with the basics of Virat Kohli’s diet and fitness regimen. For someone who is not familiar with his lifestyle might think his routines are complicated and expensive. However, as we’ve discovered, it’s not. It’s simple. Therefore, there is no reason an average Joe can’t follow his simple food habits and fitness routines.